By customer's request, this wooden strong box storage trunk features and additional, hidden wooden lock box inside. At ArtFactory.com, we specialize in designing and building custom furniture based on designs from history. These are not reproduction quality products, but are original works of art built using the same techniques and materials that were used to construct the originals. This wooden strong box storage trunk is no exception, and is designed in a true old western style. The main body is constructed with mortise and tenon, peg and dowel construction, and as shown is made from thick, solid cedar cypress. That means genuine, full length timber, never particle boards, laminates, or veneers. When we say wood, we mean "The Genuine Article". This quality of materials and construction makes this a strong box that is truly stage coach worthy. The hand forged, iron belting, handles, and locking mechanisms are meticulously precision fitted by the hands of our master blacksmiths using hammer and anvil. The hand forged solid iron corner fittings solidify the chest to make a true strong box. Blacksmith forged wrought iron rivets provide additional strength and durability. The handles are also solid, hand forged iron, and are functional to be used to lift this heavy chest. Inside, by customer request, is a hidden compartment that drops down when a bolt (disguised as an ordinary iron clavos) is removed from the side. There is also a smaller locking wooden safe box inside. The antique style lock is a historically accurate design, and functional with working key. When opened, the lid is held by a strong locking hardware system. 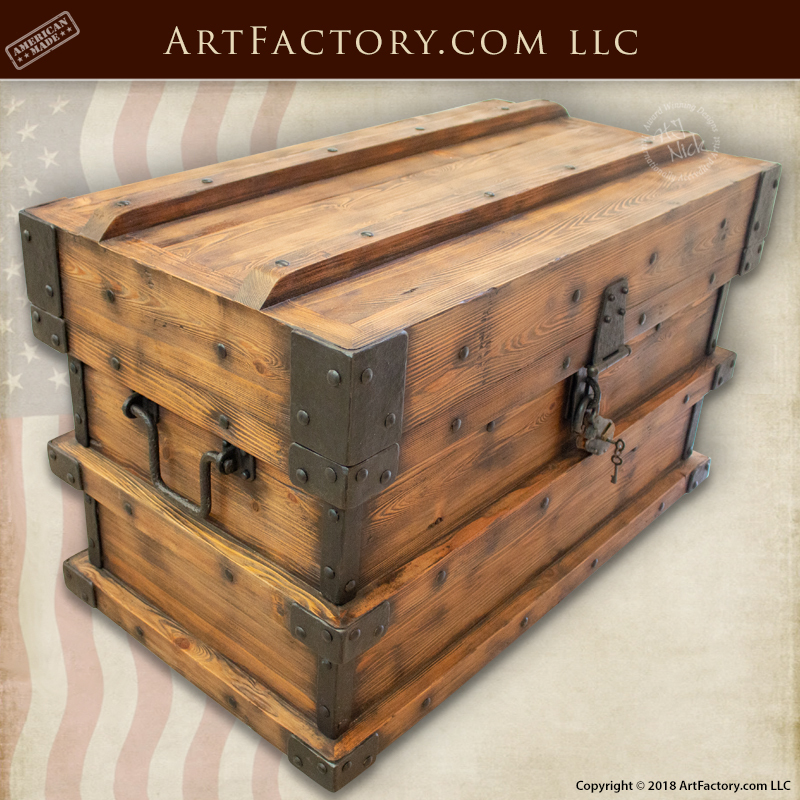 This wooden strong box storage chest is inspired by the old western Wells Fargo stage coach, strong box design. This wooden strong box storage trunk is finished inside and out using a many step open grain color infusion process. These finishes are hand rubbed, with curing times between each process. This includes multiple steps to infuse the stain colors into the grain of the wood. Additional, multiple processes of lacquer, waxes, and oils allow the finish to be part of the wood not just on the surface. This allows for by simply cleaning with oils to create a natural patina that will improve in appearance over time. We offer hundreds of different finish color choices. Unlike paint, sprays, or urethanes these finishes will not fade, flake, or chip over time. All of this adds up to a finish that meets world class fine art specifications, and will stay beautiful for generations with little or no maintenance. The wooden strong box storage trunk is designed by, built under the supervision of, and signed by award winning artist H.J. Nick. This signature certifies that all aspects of your product have been found to meet world class fine art qualifications. This makes for and investment quality piece that will have future appreciable value in antiquity. This historically inspired design has been building using period correct methods and materials. It can also be customized with any type of logo or carving of your choice. It can be made in any size or finish to fit your existing décor. Our combination of fine grade materials, and master craftsmanship allow us to offer a quality of product that is unmatched anywhere at any price. We are so confident in the quality of our products that as a result we guarantee everything forever. Call us today at 1-800-292-0008 for pricing on our wooden strong box storage trunk.